‘PIRATES OF THE CARRIBEAN’ OR ‘THE THREE MUSKETEERS’…? 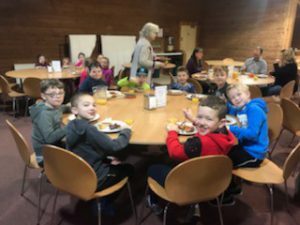 After polishing off their huge breakfasts, the children got stuck into their activities. 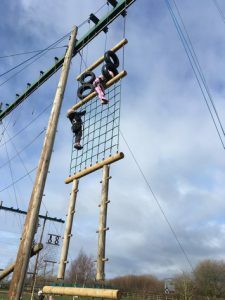 As you can see, the weather cleared and winds died down just in time for the high ropes! Mr Smith was greeted by lots of excited children at lunchtime when he visited, commenting “They are absolutely buzzing with excitement and enjoying the experience”. 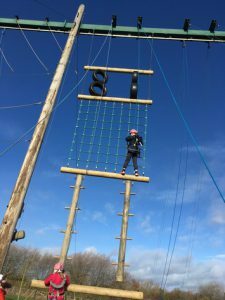 Part of this residential is about the children pushing themselves a little outside of their comfort zone and trying new things. 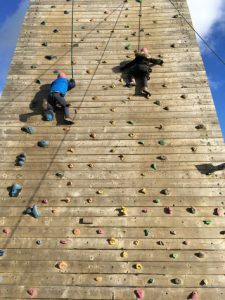 One child was a little hesitant on the climbing wall, not wanting to go any higher….until Miss Bains promised she wouldn’t give the child any spellings to do if they got to the top and, as if by magic, they made it! The child was incredibly proud of themselves and their personal achievement! This afternoon the children have embraced the art of fencing – of the sword type! The children were attentively taking in all the instructions and definitely made the most of this opportunity. They will definitely sleep well tonight!